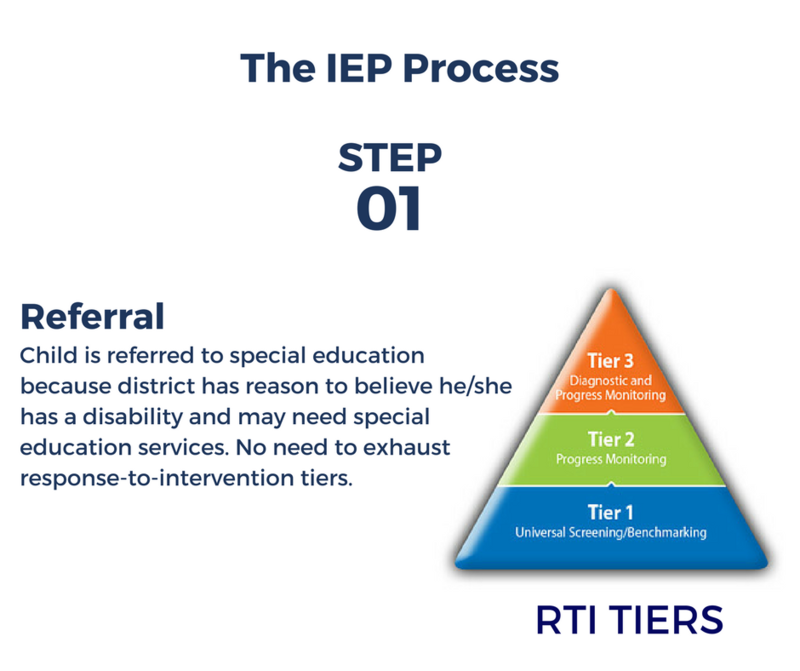 Step 1 of the IEP process is referral to special education. If you suspect your child is not meeting certain functional or academic milestones, it may be time for formal assessments to determine if your child has a disability that affects his/her ability to learn in an educational environment. In a public school setting, this is done if the child continues to achieve below standards and is not making sufficient progress despite adequate, research-based instruction. The first step is to contact your school district and request an evaluation in writing. When you request that your child be evaluated for special education in writing this is called a referral. The Individuals with Disabilities Education Act requires referrals to be in writing. My child attends a private school. Does our school district still have to evaluate him/her? Yes. The Individuals with Disabilities Education Act (IDEA) requires local public school districts to “identify, locate, and evaluate every child who may have a disability requiring special education services.” This is called “Child Find.” Call the school district of your residency and ask for the person responsible for “Child Find” and tell them you are interested in a special education evaluation for your child and follow up on this request with a letter. If your private school is in another school district, that school district is also responsible for assessing your child. My child has obvious disabilities. Do we still need to be referred to our school district for evaluation even if it’s obvious my child will need special education? Yes. Referral to special education is a necessary first step in a formal process. My child already receives special education. Does this mean we have already been referred? Yes. If your child already receives special education services, at some time in the past they were referred to special education for a comprehensive educational evaluation. You can skip this step.